The Eglo Almera Pendant Light features white opal cylinder shaped inner glass coupled with a metal overlay in a matte nickel finish creating a mosaic like appearance. 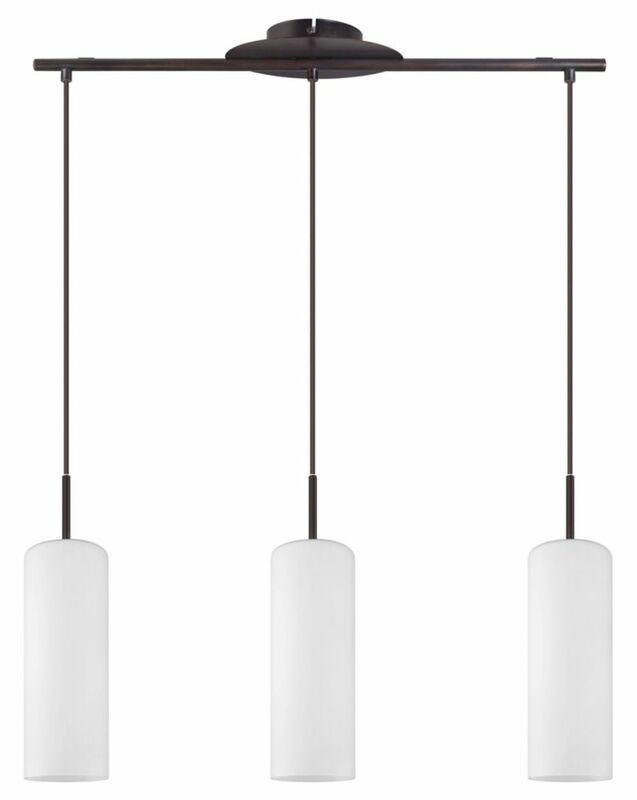 This unique 3 light linear pendant is perfectly suited for any transitional dicor and is approximately 28" wide with the drop adjustable to a maximum of 59" when fully extended. It will be stylish and functional when used as an island light or as a dining room fixture suitably positioned over a table. Use three medium base regular A19 bulb, max. 100W (not included). This hanging light fixture can be used with any standard 120V dimmer for the widest flexibility of light output. The Eglo Benita Track Light in an oil rubbed bronze finish complimented by amber coloured glass with a crackle effect will suit any traditional or transitional home dicor. This sleek design 3 head track light can be mounted on a ceiling or a wall and is approximately 21" wide. The heads are adjustable for convenience in directional lighting which makes it a perfect choice as an accent light and equally as functional for general purpose lighting requirements. Use three G9 type bulbs, max. 40W included for your convenience. This light fixture can be used with any standard 120V dimmer for the widest flexibility of light output. The Eglo Tosca Pendant Light in an antique brown finish complimented by a hard-back cream string shade is equally suited to traditional and transitional settings. This single square 13" pendant has an adjustable drop to a maximum of 59" when fully extended. It is both stylish and functional with it's 100W lamp rating. Use a medium base regular A19 bulb, max. 100W (not included). This hanging light fixture can be used with any standard 120V dimmer for the widest flexibility of light output. TROY 5 3L Suspension Light in Oil Rubbed Bronze Finish with Opal Frosted Glass is rated 4.0 out of 5 by 1. Rated 4 out of 5 by Danny from Nice Bought this a couple months ago and love it. Good quality for the price. We have just purchased this product for our island on line.When the electrician installed the light in our new home with 13 ft ceiling it hangs only three feet from the ceiling.It says on the review here that it can extend 72'.What are we missing ?? You are completely right and we thank you for bringing this to our attention. Upon investigation, we noticed that the specs mentioned above are accurate but the height is misrepresented on the retail box when converting the &quot;mm&quot; to &quot;in. The product has a a maximum height of 47.25&quot;. We completely understand your frustration if you purchased the product to have it hang 6 ft from the ceiling, please return to Home Depot for a full refund. For any further inquiries, please feel free to contact our customer service team at 1-866-492-3456 from 8am- 5pm EST. What is the distance from the ceiling to the bottom of the light pendant? What should be distance be from the counter up to the light pendant? Is the length of the pendant rod adjustable? Yes, the height (wire) is adjustable up to is 47.25&quot; (canopy to bottom of the glass). The minimum wire height is of 4&quot;. Can this be installed on a vaulted (sloped, angled) ceiling? Are the pendant lengths independently adjustable? Yes, it can be mounted on a sloped ceiling and the wires are independently adjustable. I broke one of the Opal Frosted Glass. How can I get a replacement frosted glass?